We have been getting a lot of fall squashes from the CSA! At least two per week, usually weighing in over 1 lb. apiece. Good thing I love fall squash! It’s also been fun to get to know some of the different varieties. 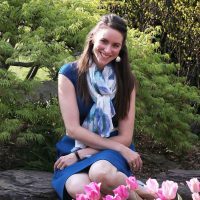 Normally, I am a butternut-acorn-pumpkin girl, but now I am learning about kabocha, buttercup, carnival, and the lovely delicata. This is an amazing recipe from one of my favorite cookbooks: Super Natural Every Day. I love that the curry isn’t too spicy, but it perfectly complements the sweetness of the squash. Plus, this meal is so healthy! 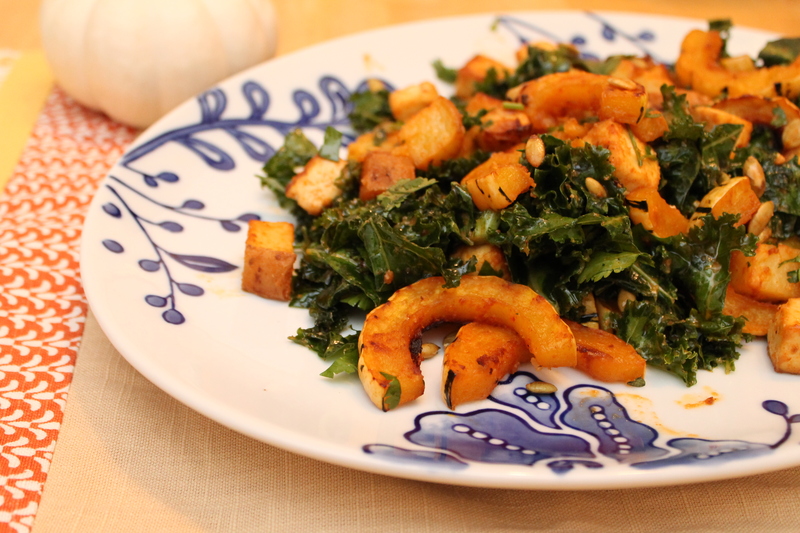 It combines fresh potatoes and kale, which are also in season right now from the CSA, with fall squash and tofu: Perfect nutritional balance of brightly colored veggies, complex carbs, and protein. 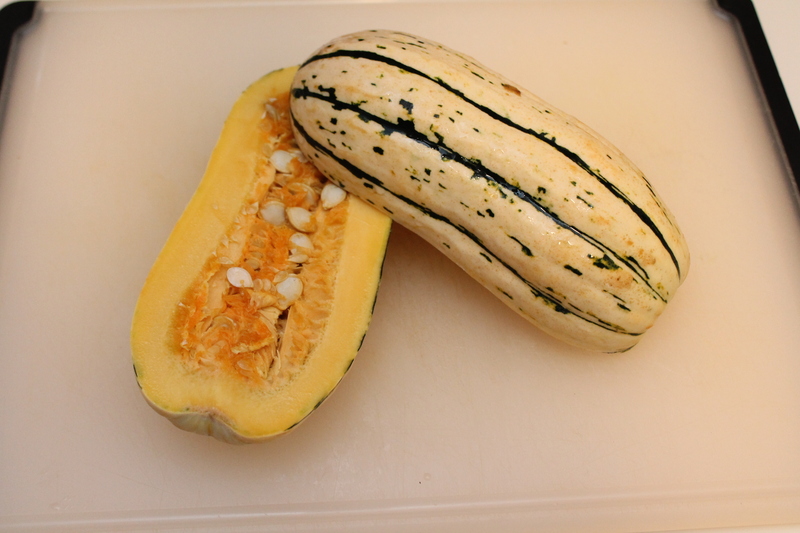 Cut the squash in half lengthwise and scoop out all the seeds. Then slice in half moons about ½″ thick. Cut two medium-size potatoes into bite-size chunks. I like to leave the skin on, because that’s really where most of the nutrients are. If you have particularly small potatoes, you can use more, but the ones that arrived in my CSA box this week were about the size of my fist. Dave said he could actually do without the potatoes altogether, so I am glad I didn’t overwhelm the dish with them! Cut your tofu into approximately 1″ cubes. You want them to be a bit larger because you will be roasting for a long time, and they will shrivel and hollow out slightly in the heat. I bought a 14oz. pack of extra-firm tofu, which is about the only size my regular grocery store offers, so I just used half of that in this dish. If you like tofu a lot (um, I don’t…bad vegetarian), you could use more, but for my tastes, 7 oz. of tofu was about all this recipe could really stand! In a measuring cup, whisk together olive oil, red curry paste, and miso paste. I used yellow miso, which is what I had on hand, but white miso would also be nice. And if you aren’t a huge fan of spicy food, then take note: the glass jars of red curry paste made by Thai Kitchen are quite bland. Okay, I am dissing them a little, because we are usually hoping for a vibrant, nose-running kind of heat in our curries, and you can’t even get from this brand even if you use the whole bottle. But! If you are not into hot, hot spicy food, then this is the curry paste for you. I think it works really well in this dish, because it adds an accent to the miso and just a suggestion of heat. The flavors come out delicious. Toss the cut veggies and tofu in half of the miso-curry mixture and lay them on a cookie sheet in a single layer. Do not salt them. Trust me. Miso tastes salty enough! Roast for 35–40 minutes, until lightly browned and tender. You should turn these at least once, and please note that the veggies are going to brown on the pan side before they brown on the top. So if you wait to turn them until they look brown on top, chances are the bottoms will be scorched. Luckily for me, my husband actually prefers things burned, so he doesn’t care if I goof up. (Though this also makes it hard to gauge whether I’ve done something correctly at times…as his measure of culinary excellence is a little wonky.) 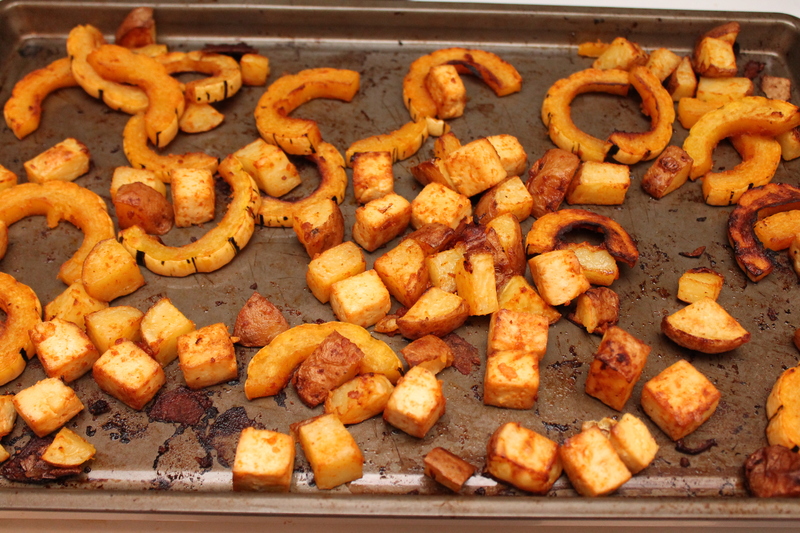 Anyway, keep a careful watch and plan to turn your roasting veggies/tofu around the 25 minute mark or so. 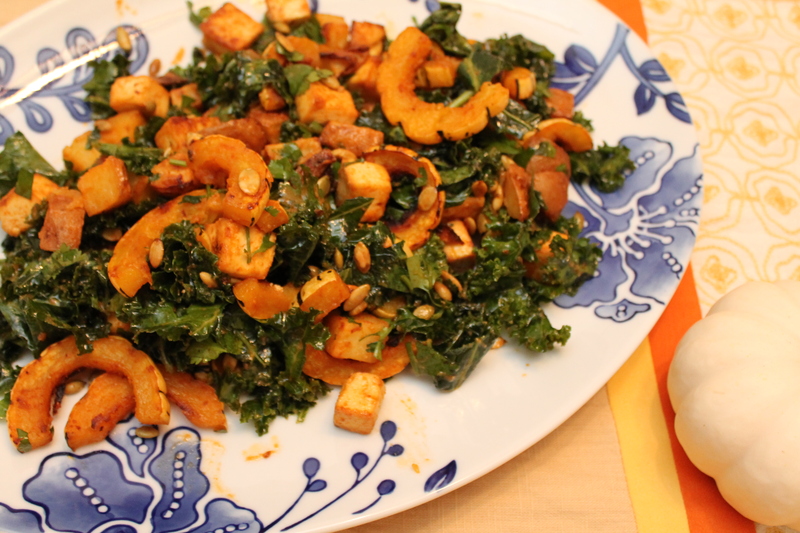 Meanwhile, squeeze a lemon into the remaining misi-curry mixture and pour it over the kale. 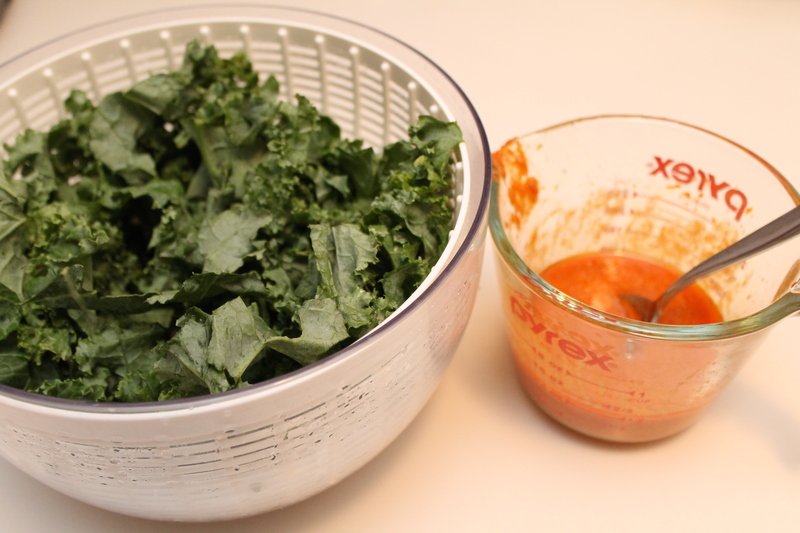 Toss to coat well, and let the kale sit at room temperature until the veggies/tofu are done. Also, go ahead and toast some pepitas. Pepitas are raw pumpkin seeds. You could, of course, use seeds you harvested from your squash, but that would be a much lengthier process involving oven-roasting to help them dry out. I would save those seeds for a different meal. I toasted my pepitas over medium high heat on the stovetop, shaking the pan regularly, for about 5 minutes, until they started browning and popping. You could but roasted pepitas (though they are often toasted in oil, so watch out) if you want to save yourself a step! When the veggies are fork-tender, remove them from the oven. Toss them with the kale, chopped cilantro, and pepitas. Let stand for a minute or two, to help the kale wilt slightly, then serve! 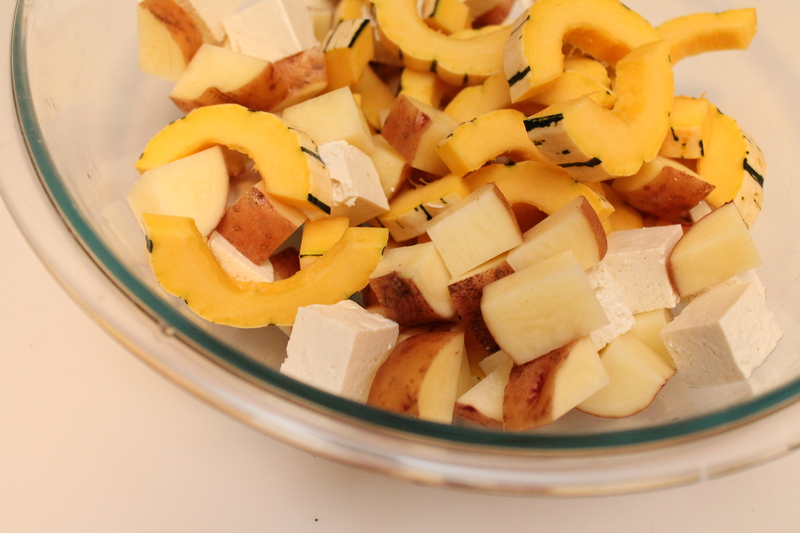 Combine squash, potatoes, and tofu in a very large bowl. In a separate bowl, whisk together olive oil, curry paste, and miso. Pour half of the miso-curry (about ⅓ cup) over the squash mixture and toss to combine. Spread the vegetables out on a rimmed baking sheet in a single layer. Roast for 35–40 minutes, turning at least once to prevent scorching on the bottom. When the vegetables are lightly browned and tender, remove from the oven. Meanwhile, whisk lemon juice into the remaining miso-curry sauce. Pour over the kale and toss to coat. When the vegetables are done roasting, toss with the kale, pepitas, and cilantro. Serve family style in a large bowl or on a platter.